Coach requests are limited to coach/child from same family relationship. To have your child on the same team as a friend or sibling, consider coaching. There will be 2-3 adult coaches per team. NOTE: This year there will be 4 cheerleading teams split between K-3rd Girls and 4th-6th Grade Girls divisions. The younger division will be scheduled at 5:30 pm either M,TU or Th and the older division will be scheduled 6:30 pm on THURSDAY only. We will add an additional upper division team if registration #’s and available coaches supports the addition. 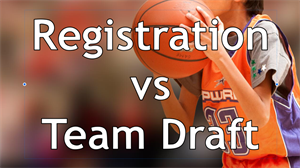 Drafting teams in Upward Basketball is different from dividing teams in a public recreation league. Because the main objective is to create equal teams, players are drafted in a non-biased way according to height and ability using ULM (Upward League Manager) scoring during evaluations. This program format enables Upward to package and process your uniform order accurately and in a timely manner. Two principles guide the drafting of teams in an Upward Basketball League. 1) players are divided according to grade so they will compete against children of the similar general skill level and size; 2) girls and boys do not play in one another’s division except in the K5 division. Upward Basketball partners are committed to keeping the boys’ and girls’ divisions separate. Coaching Links are assigned where an adult family member's coaching application has been approved. HINT: Moms and/or Dads, be sure you co-ordinate the day of week you prefer coaching with a day NOT excluded on you child's registration. Practice Day Exclusion: To allow the player / family some practice schedule flexibility they may included one day of the week as a Practice Day Exclusion (this is not required). The Practice Day Exclusion allows a player to be excluded ( only one Day) from teams that practice on that night. This choice is not a guarantee. When the draft is done in ULM, the practice day exclusion is considered along with balancing teams by evaluation scores and heights. Carpool Links: You will have an opportunity to add a carpool link during the registration process. This option is designed to help families who may have transportation issues for practice or games. It is not intended to link multiple friends together. Only one carpool link per child. Carpool links must be the same gender, and division (eg: 1st & 2nd grade boys). Our computerized draft system try’s to links players together on the same night so both participants MUST list each other for the link to be complete. Although we try to honor as many of these carpool requests as we can, listing a carpool buddy is NOT a GUARANTEE that the players will be on the same team and/or night. Volunteering: There is a section within the registration process for volunteering to coach or referee. If you are interested in coaching your child's team or helping with the program, fill out this section. This information is used to generate an interest list. You will be contacted by someone on the Upward leadership team with an official application and background check form, which is required for all Upward volunteers.